How Much Will Low Oil Prices Stimulate Demand? Since weak oil demand growth is a major ingredient in the current oil price crash, higher demand stimulated by low prices could be a moderating factor. While US demand has risen since prices fell, there are several reasons why the global response may be slower to appear and less dramatic. One of the main factors that will determine the depth and duration of the current slump in oil prices is the extent and timing of a resulting rebound in demand. It is likely to occur first in countries like the US, where fuel taxes are low and consumers see the results of lower oil prices at the gas pump relatively quickly--a $1.65 per gallon drop already, since June. However, other factors besides taxes could impede faster demand growth elsewhere. From 2007 to 2009 the combination of high oil prices and a weak economy reduced US petroleum demand by almost 2 million barrels (bbl) per day, compared to its 2006 peak. The first volumes backed out of the market were imported refined products, which had grown rapidly from the mid-1990s until 2005. Low domestic demand and expanding US oil production then led US oil refiners to seek new markets, particularly in Latin America. US petroleum product exports have increased by around 1.7 million bbl/day since the recession began. These refiners might reasonably expect their domestic and foreign markets to grow faster with oil prices dramatically lower. So far, it's hard to see more than hints of this in the lagged data from the US government or API, which reported December gasoline demand at a 7-year high. It's also hard to discern how much can be attributed to oil prices, rather than to US economic growth and a falling unemployment rate. The October update of vehicle miles traveled from the US Department of Transportation was still well below its 2008 peak but showed a modest upward trend, although that seems to have begun before oil prices fell. Other indicators are also mixed. By the end of last year sales-weighted fuel economy of new vehicles sold in the US had declined by 0.7 miles per gallon from its August 2014 peak. That reflected US consumers buying larger vehicles, including more SUVs, fewer hybrids and only slightly more plug-in electric cars than in the prior year. Despite this retreat, full-year-average fuel economy tracked by the University of Michigan still showed a more than 5 mpg gain since 2007, equating to 20% better fuel efficiency. So the roughly 45 million cars and light trucks sold in the US in the last three years--nearly a fifth of today's light-duty fleet--will use less gasoline than the ones they replaced, even in the most robust response to low gas prices imaginable. Globally, growth prospects seem equally mixed. Since last July the International Energy Agency has reduced its forecast of 2015 petroleum demand growth by a cumulative 500,000 bbl/day, to +0.9 million bbl/day, as the global economy weakened. These conditions could combine with currency-related effects to dampen, or at least delay, a potential surge in global oil demand due to low prices. Because oil is traded in US dollars, the dollar's recent strength shrinks the oil savings experienced by other importing countries. While all of these countries are paying less for oil than they did last summer, exchange rates have eroded 10-30% of that benefit. The chart above displays this effect for the Euro and Japanese Yen. Closer to home, currencies like the Mexican and Colombian Pesos have depreciated by 12% and 29% since June, respectively. That could prove significant, since Mexico's refined product imports from the US averaged over 500,000 bbl/day in 2014 (through October), along with over a million bbl/day to the rest of Latin America. Since petroleum products are sold in local currency, after tax at the pump, consumers in many countries have seen a smaller drop to which they might respond, compared to US consumers. The average German gasoline price has fallen by just 19% since June and the average UK price by 20%, compared to 42% in the US. Meanwhile state-controlled gasoline prices in Brazil and Mexico have gone up. That's unlikely to induce more driving. So far the weekly figures for US refinery throughput are up compared to last year, implying higher expected product sales. However, US inventories of gasoline and diesel fuel have also been growing for the last several months. If rising demand doesn't erode inventory gains soon, refiners may need to reduce processing rates, and that would feed back to oil prices. The next few months of energy statistics should tell a very interesting story. Was 2014 Really the Warmest Year? The media is widely reporting 2014 as the warmest year on record, yet the underlying data don't support that conclusion. The data actually lead to a different finding, of 2014 tied with 2010 and 2005 within the margin of error, reflecting little warming since 2005. When I opened today's Washington Post and turned to the Opinion section, I found two op-eds that began almost identically: Eugene Robinson's column stated, "We now know that 2014 was the hottest year in recorded history," while Catherine Rampell announced, "Last year, government scientists tell us, was the hottest year on record." The President even repeated this in his State of the Union address. However, that is not really what the figures in question indicate. I suppose it's understandable that the Post's editors and those of many other media reporting the same finding might rely on the expertise of the government agencies involved, rather than digging deeper. The Post's columnists apparently based their comments on information provided to the media by NASA's Goddard Space Flight Center. The NASA press release, entitled, "NASA, NOAA Find 2014 Warmest Year in Modern Record," included links enabling one to scrutinize the raw data upon which this conclusion was based. I've reproduced the relevant portion below in picture form as of noon today, since this data is subject to periodic revisions. NASA's dataset displays the differences between measured temperatures and the 14.0°C average from 1951-80. On this basis it confirms that the average recorded temperature in 2014 was 0.02°C higher than the average for the previous warmest year, 2010, which was in turn 0.01°C higher than 2005's. Unfortunately, neither that page nor the press release includes any information about the uncertainty inherent in these figures, which turns out to be larger than the increase from 2010-14. All physical measurements, including those from the weather stations providing data to NASA, are plus-or-minus some error. Averaging them doesn't entirely negate that. Within the accuracy of these temperatures, it's not possible to distinguish among 2005, 2010 and 2014; they represent a statistical tie. That fact was explained more clearly than I have done in a report on January 14, 2015, from the team of scientists at Berkeley Earth. Hardly climate skeptics, this is the same group that made headlines a couple of years ago with a comprehensive study of existing climate data. Why does this distinction matter? After all, measured temperatures have warmed nearly 2° Fahrenheit since the early 20th century, as shown in the graph above. Whether last year or 2010 was warmer might seem like more of an academic point than a practical one. 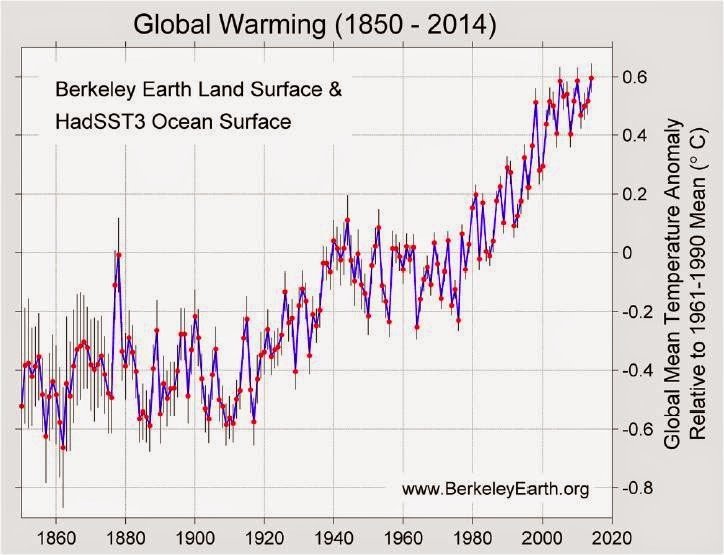 However, the refrain of "record temperature" reports gives a false sense that the warming is accelerating. Instead, as the Berkeley Earth report found, "the Earth's average temperature for the last decade has changed very little." That's a very different impression than the one created by the stories I saw, with implications for how we respond to the risks of climate change. Intuition suggests that the current sharp correction in oil prices must be bad for the deployment of renewable and other alternative energy technologies. As the Wall Street Journal's Heard on the Street column noted Wednesday, EV makers like Tesla face a wall of cheap gasoline. Meanwhile, ethanol producers are squeezed between falling oil and rising corn prices. Yet although individual projects and companies may struggle in a low-oil-price environment, the sector as a whole should benefit from the economic stimulus cheap oil provides. The biggest threat to the kind of large-scale investment in low-carbon energy foreseen by the International Energy Agency (IEA) and others is not cheaper oil, but a global recession and/or financial crisis that would also threaten the emerging consensus on a new UN climate deal. We have already seen renewable energy subsidies cut or revoked in Europe as the EU has sought to address unsustainable deficits and shaky member countries on its periphery. Earlier this week the World Bank reduced its forecast of economic growth in 2015 by 0.4% as the so-called BRICs slow and the Eurozone flirts with recession and deflation. The Bank's view apparently factors in the stimulus from global oil prices, without which things would look worse. The US Energy Information Administration's latest short-term forecast cut the expected average price of Brent crude oil for this year to $58 per barrel. That's a drop of $41 compared to the average for 2014, which was already $10/bbl below 2013. Across the 93 million bbl/day of global demand the IEA expects this year, that works out to a $1.4 trillion savings for the countries that are net importers of oil--including the US. This equates to just under 2% of global GDP. Although the strengthening US dollar mitigates part of those savings for some importers, it's still a massive stimulus--on the order of what was delivered by governments during the financial crisis of 2008-9. Even after taking account of the reduced recycling of "petrodollars" from oil producing nations, which have historically invested billions of dollars a year outside their borders, the pressure on governments to reduce expenditures on programs including renewable energy should be lower than it would be without this unexpected bonus. Just as the arrival of $100 oil in the last decade didn't produce an overnight transformation to renewable energy, $50 oil seems unlikely to harm the sector much, particularly in light of the cost reductions that wind, solar PV and other technologies have demonstrated in the last several years. If developers use this opportunity to shrink their costs further and become economically competitive with low or no subsidies, they will be well-positioned when oil prices inevitably recover, whether a few months or a few years in the future. 2014 was an extraordinary year in energy, vividly illustrating both sides of the Chinese proverb about interesting times. Oil market volatility was the big story for much of the year, with the dominance of geopolitical risks finally yielding to surging supplies. Of the two energy revolutions underway, shale wields the bigger stick for now, while the growth of renewables gathers momentum. All of this has implications for 2015 and beyond. The US remained the epicenter of the shale revolution this year, with development elsewhere still subject to uncertainties about economic production potential, infrastructure, and the rules of the road. A comparison of oil-equivalent additions to US energy supplies from oil, gas and non-hydro renewables for the first nine months of the year highlights both the significance of shale and the differences in relative scale that impede a rapid shift to renewables. US shale drilling added over a million barrels per day of "light tight oil" (LTO) production, compared to 2013, based on US Energy Information Administration data for the first nine months of the year. That brings cumulative gains since 2011 to nearly 3 million bbl/day. This hasn't just upended the global oil market; it has also revolutionized the way oil moves across North America. Over a million bbl/day now moves by rail, a figure recently projected to peak at 1.5 million by 2016. Nor is that entirely the result of delays to pipeline projects like Keystone XL. One proposed pipeline for Bakken LTO was reportedly canceled due to a lack of interest from shippers. Rail is expensive but provides producers and refiners with greater flexibility in both volume and destinations than fixed pipelines. The collapse of oil prices has prompted many producers to reassess drilling plans, although it has been a boon for refiners and consumers. Refining margins look relatively healthy, at least based on the proxy of "crack spreads", the difference between the wholesale prices of gasoline and diesel and the oil from which they are made. Some refiners also anticipate that low prices will spur demand growth, as described in a fascinating Wall St. Journal interview with Tom O'Malley, who has turned a succession of castoff refineries into profitable businesses. We may already be seeing the demand response to lower prices. November US volumes were at a 7-year high, according to API. This is unlikely to be replicated quickly elsewhere, however, for the same reasons that global oil demand was slow to moderate when prices rose over the last several years: In many countries the influence of oil prices on consumer behavior is overwhelmed by fuel taxes or subsidies. With prices now falling, some developing countries are capitalizing on the opportunity to unwind billions of dollars in consumption subsidies, offsetting market drops. That could have important implications for future oil demand and greenhouse gas emissions. Meanwhile US consumers have watched retail gasoline prices fall by $1.39 per gallon since July and by over a dollar compared to a year ago. If sustained, the effective stimulus could exceed $100 billion annually, ignoring the effect of lower prices for jet fuel, diesel and other products. It's not surprising that half of respondents in last month's Wall St. Journal/NBC poll indicated this was important for their families. While oil has been making headlines, shale gas without much fanfare added the equivalent of another half-million bbl/day to US production. That explains why despite enormous drawdowns of gas during last winter's "Polar Vortex", gas inventories began this winter much closer to normal levels than was widely expected in the spring. Gas has lost a little ground in electricity generation to coal in the last two years, but few reading the EPA's proposed Clean Power Plan regulation would expect that trend to continue. Shale gas remains controversial in some areas due to perceived environmental and community impacts. New York state is apparently making its temporary ban on hydraulic fracturing ("fracking") permanent, preferring to rely on shale gas supplies from neighboring Pennsylvania. Yet while shale drilling in North Dakota has led to an increase in gas flaring--burning off gas that can't economically reach a market--the latest findings from the University of Texas and Environmental Defense Fund measured methane leakage from gas wells at an average of 0.43%. That shrinks gas's emissions footprint and enhances its potential role in climate change mitigation. Turning to renewables, wind energy now provides a little over 4% of US electricity. However, its growth has slowed due to uncertainty about continued federal subsidies. The wind production tax credit, or PTC, had previously been extended through 2013 in a way that allowed projects brought online later to benefit from the extension. It was just extended again through the end of 2014, along with a broad package of other expiring tax benefits. This late revival might be a gift to a few projects already under construction, but it seems unlikely to spur additional projects without further legislative action in the new Congress. Solar power has also made great strides, with costs falling rapidly and US additions in 2014 expected to reach 6,500 MW, likely outpacing wind additions. This is happening despite the ongoing trade dispute between the US and China over imported solar modules. Utilities are already experiencing solar's impact on their traditional business model. Yet as important as wind and solar power are likely to be in the future energy mix, their impact in 2014, at least in the US, was still dwarfed by the growth of shale resources. Drilling is already slowing down, however, so renewables could take the lead in 2015 as shale is expected to post smaller gains. Looking ahead, the global focus on greenhouse gas emissions will increase in the run-up to the Paris climate conference in December. It remains to be seen whether enough progress was made in the recently completed talks in Lima, Peru, to resolve the significant remaining obstacles to a new global climate agreement. And while oil supply gains trumped geopolitics in 2014, a list of risk hot-spots from the Council on Foreign Relations includes several scenarios with major implications for oil and/or natural gas prices. Meanwhile we can expect the new Congress to take up Keystone XL, oil exports, EPA regulations, and other energy-related issues. I'd bet on another lively year.